With the US pulling out of the Paris Agreement, China and Germany are making a very public display of leadership on climate protection and transition to green energy. The export heavyweights are eager to keep the global economy on track towards a transition to renewable energies – both to drive international climate action and to promote their powerful renewables industries, experts say. China and Germany share a “Dream” and a “Treasure” – two giant pandas personally delivered to Berlin Zoo by President Xi Jinping on a two-day visit to Germany ahead of the G20 summit in Hamburg. Panda diplomacy has been a longstanding feature of Chinese foreign policy, demonstrating close ties to a partner country. Germany and China, two outstanding economic powerhouses of the last decade, are going into the summit with a public show of unity to preserve the conditions they thrive on at a summit especially aroused by questions concerning energy and climate. Apart from Mengmeng and Jiao Qing, as the two pandas are called in Chinese, both also share the “dream” of putting the global economy on track towards a sustainable and low-carbon energy future, an idea promoted by the German G20 presidency and by that of China in the year before . And the countries with the biggest trade surplus in the world also share the “treasure” of being prepared to massively benefit from a shift towards renewable energy generation. Consequently, US President Donald Trump’s announcement to pull his country out of the Paris deal was strongly denounced by Beijing and Berlin. On his visit to the German capital, Xi vowed to back Merkel’s focus on climate protection at the G20 summit, promising Chinese support for “positive progress” towards a greener ecomony. Merkel thanked her guest for his support, saying together their countries could convince sceptics to stick to the goals of the Paris Agreement. “Although I don’t know what the result will be,” she cautioned. "A collective sigh of relief"
This can be seen as a positive development by those who had hoped Trump’s opt-out might galvanise an axis between China and Germany to further the Paris Agreement’s aims and replace America’s leadership on climate diplomacy. Under Trump’s predecessor, Barack Obama, Washington was crucial in brokering a quick ratification of the agreement. “There was almost a collective sigh of relief across Europe when China reaffirmed its support of the climate agreement,” Björn Conrad, researcher at the German think tank Mercator Institute for China Studies (Merics), said at a conference on Sino-German climate cooperation a week before the Hamburg summit. Although China and Germany are among the world’s biggest greenhouse gas emitters, ranking first and sixth, respectively, “probably more than many other countries, they have understood the economic opportunities that come with climate protection” and are eager to “avoid a downward spiral of declining ambitions,” Conrad argues. Germany’s Energiewende is a long-term project held close to the public’s heart, and is finally starting show potential for profitmaking. China, meanwhile, is experiencing the environmental and health impacts of three decades of rapid industrialisation and has shifted from being an obstacle to international climate diplomacy to the largest green energy investor in the world. Germany makes no secret of its ambitions to use its trademark Energiewende both to protect the climate and to leverage its domestic industry as an experienced provider of low-carbon technologies. And although China’s energy-hungry economy consumes roughly half of the coal burned globally each year, the country also is also a leader in solar panel production, boasts four of the 10 largest wind turbine manufacturers and is set to vastly extend its lead in battery production, a key component for the success of renewables and electric mobility. From human rights and press freedom to copyright infringement and trade barriers, there are plenty of points of contention between Beijing and Berlin (and Brussels). But Susanne Dröge, climate policy researcher at the German Institute for International and Security Affairs (SWP), says a diplomatic entente on energy policy is indeed viable. Karsten Sach, climate policy director at the Federal Environment Ministry (BMUB), says despite their differences, shared “core interests” give Beijing and Berlin good reason to close ranks on climate policy and persuade other G20 members to continue the process initiated in Paris. Their governments must take a “pragmatic” approach in Hamburg, “show we are moving in the right direction and strive to find solutions,” Sach says. Germany’s chief climate diplomat says the countries could focus on existing initiatives, such as “getting carbon prices right” via a jointly developed emissions trading system. Collaboration could also leverage green growth opportunities in fast-developing regions in Asia or Africa, he says. Merkel's and Xi's announcement in Berlin to intensify cooperation in joint projects in third countries, for instance in the framework of Bejing's New Silk Road Initiative, seemed to confirm Sach's assessment. But the climate diplomat adds that they must also ramp up efforts to forge a common strategy on contentious issues like decarbonising transport, where China’s plans to introduce a mandatory electric car quota caught the German car industry unprepared. According to Germany’s former environment minister Klaus Töpfer, the Chinese initiative could ultimately help Germany address inevitable changes in the industry. Shortly after China announced its e-car quota plans in November 2016, Töpfer mused that the planned policy, in the country that recently replaced the US as Germany’s largest trading partner, could do more to speed up German carmakers’ historically sluggish shift to e-mobility than any piece of domestic legislation. Relieve Germany's Energiewende of its "provincial character"
A tough Sino-German position on energy at the G20 might appear an ad-hoc alliance forged under pressure. But it is not entirely new. Cooperation between Germany’s economy ministry (BMWi) and China’s energy reform commission NDRC began in 2006, well before Trump began to disrupt international politics, and was formalised in mutual agreements on energy efficiency and renewables expansion in 2013. Aside from high-level political alliances, there are numerous examples of Chinese-German cooperation on energy in academia, industry and civil society, says Shuwei Zhang, energy policy researcher for emerging economies at German think tank Agora Energiewende. 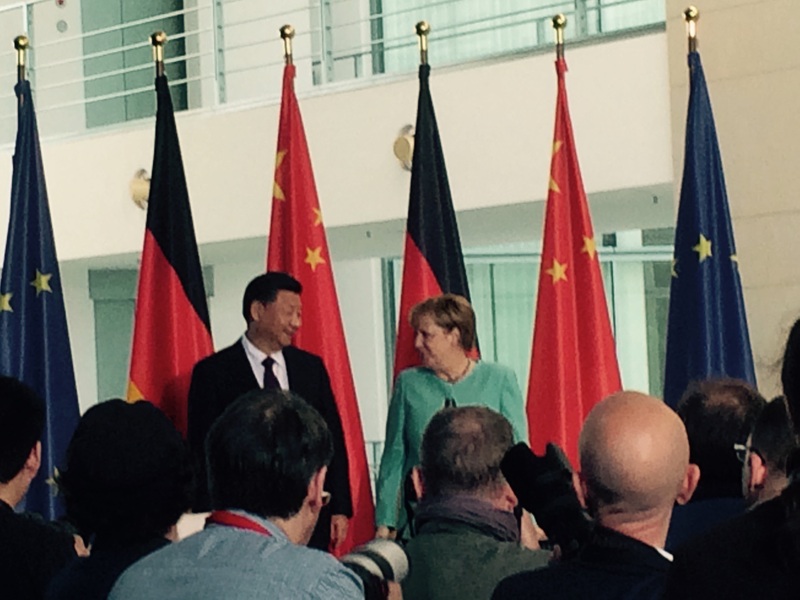 “Chinese partners benefit from German energy policy methods,” Zhang says. The German example for setting up a detailed timeline for a gradual energy transition, as well as its transparency on the make-up of its energy system are valuable lessons for Chinese, he says. Writing in German newspaper Freitag, Maximilian Meyer, a researcher at the Germany Institute at Tongji University in Shanghai, argues that China’s energy transition could help “relieve the German energy debate of its provincial character” – allowing the German Energiewende to realise its potential as part of a truly global transition.